Cutting down a tree is something that’s generally better left to the professionals to handle. This is mostly the case for large trees, trees that are near a structure, rotten trees, or if you simply feel uncomfortable tackling the job. If, however, you’re dealing with a small tree and you feel confident enough for the task, then this may be something you can do yourself. Safety should be your utmost concern so it’s important that you use only the right tree cutting tools and follow safety recommendations. It will also be helpful to learn about the different tree-cutting techniques to make the job easier. And if it’s your first time to use a chainsaw, be sure to enlist the help of an experienced chainsaw user. A chainsaw is typically the first tool that most people think of when the topic of tree cutting is brought up. Using a chainsaw is the simplest and quickest way of cutting down a tree. Chainsaws are quite powerful and can cut through wood with relative ease. The power of these tools also means that you need to take care when operating them so as not to have an accident. If you need to saw through logs, or if you have a small tree to fell, then owning a chainsaw will allow you to make short work of the task. A good chainsaw will be able to cut through wood without any problems, and you won’t have to worry about exerting yourself too much. As long as you are careful with this tool, it will be one of the simplest ways to take care of your tree cutting needs. People use chainsaws for all types of tree cutting purposes, including cutting down large branches. It should also be noted that chainsaws come in several different styles. The most powerful chainsaws are always going to be gas-powered. These will be pretty noisy overall, and they don’t run cleanly like the other options. Electric-powered chainsaws lack a bit of the power when compared to gas-powered models, but they are quieter, and there are no fumes. Which type of chainsaw is going to appeal to you the most will depend on your needs. If you have a lot of trees to cut down, then the increased power of a gas-powered chainsaw will be very beneficial. For most purposes, an electric-powered chainsaw is going to work just as well. You also won’t need to purchase fuel for the electric-powered chainsaws, and this adds to the overall convenience. Pole chainsaws are excellent tools that will make cutting down tree branches a lot simpler. If you have tall trees that you want to be able to trim, then you will want to consider getting a pole chainsaw. No one wants to have to use a chainsaw while climbing a ladder if it isn’t absolutely necessary. When you need to cut down tree branches that are high up in the air, the reach of a pole chainsaw is going to make the job a lot easier than it would otherwise be. Much like the chainsaw listed above, these types of tools come in different styles. You will be able to purchase gas-powered models and electric-powered models. As you would expect, the gas-powered models will be more powerful, and the electric-powered ones are cleaner. Either option should work great for your purposes, so it’s best to simply choose whatever option appeals to you the most. The reach of these pole chainsaws is significant. Exactly how long a pole chainsaw will be will differ from model to model. The one being showcased here will allow you to reach up to 15 ft. That makes cutting down a high tree branch a lot simpler overall. You won’t have to feel like you’re putting yourself in a precarious position just to get the job done. You can trim branches that are pretty thick with this powerful tool. Even branches that are 8-inches in diameter will not be a problem when you own this pole chainsaw. If you want to make trimming and cutting down tree branches simpler, then purchasing this tool is going to be very appealing. You’ll have an easy time using it, and you won’t have to worry about trying to balance on a ladder. Pruning shears are among the most common tree cutting tools that people use every single day. A good set of pruning shears will make trimming tree branches simple. You can use these tools to trim your trees and keep them looking as nice as possible. You may not be able to trim branches that are too thick with these shears, but it is generally meant for pruning smaller limbs. People who care about maintaining their property to the best of their abilities will want to own pruning shears. They’re a convenient tool to use when you’re trying to shape a tree to make it look aesthetically appealing. You’ll be able to use the pruning shears very easily, and it isn’t difficult to use them while up on a ladder, either. They will definitely prove to be useful to you if you have many trees on your property. Of course, a lot of people use these shears on things other than trees. You will see people using pruning shears like this to trim their hedges and other things on their property. 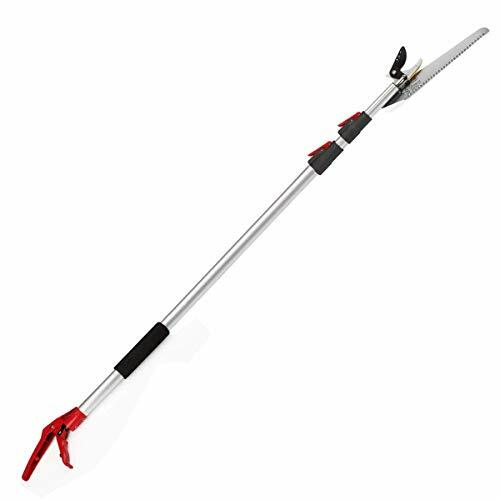 It’s a good tool to keep in your garden area because it will be handy for trimming a lot of plant-life. You can count on this tool to last you for a long time too, so it’s a worthy purchase. Tree loppers are kind of like the next step up from pruning shears. These tree loppers are capable of cutting branches that the pruning shears simply can’t handle. You can fit the branch that you are trying to cut in-between the powerful blades of these tree loppers. You then use your own power to cut it down and then move on to the next one. It’s a simple concept that works very nice overall. Using these tree loppers is simple and very effective. When you need to cut down branches on your trees, the tree loppers will be the first tool that you turn to. As long as the tree branch isn’t incredibly thick, you should be able to cut it down with this tool. Thicker branches will need something like the chainsaw or pole chainsaw to make the process easier. These tree loppers being shown here are capable of extending as well. This can be very useful for reaching branches that are a bit higher up. This way, you should be able to avoid climbing a ladder. Some people get nervous on ladders, so this option is going to be welcomed by many. This is a comfortable tool to use, too. The grips on this set of tree loppers help you stay relaxed, even when you have been working for long hours. It won’t be uncomfortable to hold these tree loppers, so you’ll always have the best experience possible. Combine this with the overall durable build of the tool, and it is easy to see why this is a recommended option. A long reach tree pruner is going to be a good option to consider when you’re afraid of ladders. If you have trees with branches that are high up in the air, then you will need a reliable tool to trim them. If you aren’t willing to climb a ladder, then you need an option that will work for you. The long reach tree pruner is the optimal solution for trimming tall branches without having to put yourself at risk. The overall reach of this tool is quite impressive. You can reach 7 ft into the air with this handy tool, making tall branches a lot less bothersome than they were before. Short people really enjoy having tools of this kind because it extends their reach and allows them to successfully cut and trim branches from the ground. It is truly a convenient tool to own, so you will want to consider it. Another important quality of this tool is that it is extremely lightweight. People who are smaller will really appreciate that it is easy to hold. You won’t feel like it is cumbersome at any time during your trimming or cutting job. It’s a good tool that will always work well for you when you need it. This pruning saw is going to be one of the most useful tools for you when you want to avoid using power tools. You can cut down even thick branches when you have a high-quality pruning saw of this kind. Most people do use these saws for general pruning purposes, but they can be used for cutting down large branches, as well. The teeth on the blade will make the job pretty easy overall, so you’ll be able to count on this tool to get the job done. This particular pruning saw features a comfortable “D” grip. There is even a soft spot in the grip that makes it feel better on your hands, ensuring that you’ll have a smooth experience the entire time. You will have an easy time holding the saw and getting it into the right position to cut your branch. It’s easy to use and very effective overall. The bow saw is another common manual tree cutting tool. You can place the bow saw on the branch that you are trying to cut down, and then you should effectively rock it back and forth. This will cut through the tree branch, and you’ll have your job completed before you know it. These saws are very popular for their ease of use, and you don’t have to be incredibly strong just to get them to work properly. The ergonomic handle really helps this tool to feel natural while you’re using it, too. You’ll be able to cut down large branches without it feeling too difficult. These saws are cost-effective, making them a great option for cleaning up your yard. You’ll be able to find saws like this at most hardware stores, too. Another traditional tool that you think of for cutting down large trees is the ax. A chopping ax is going to help you to cut down even a large tree effectively. It can be quite a bit more work to do this than it would be using a chainsaw, but it can be preferable in some situations. When you want to cut down a tree manually, having a reliable chopping ax around will make a huge difference. This ax is incredibly sharp, allowing it to cut through wood very smoothly. It will make very short work of smaller trees due to how sharp it is. Thicker trees will be able to be cut down effectively, as well. People use axes like this to cut down branches, too. It also comes with a convenient sheath that you can place it in while it isn’t in use. This helps to keep you as safe as possible. It is a very sharp ax, so you will definitely want to take care while handling it. Storing it properly will keep this chopping ax working as a reliable tool for you for a very long time. A hatchet is essentially a more portable version of the chopping ax that is highlighted above. You can use a hatchet to effectively cut tree limbs, and you can cut down small trees. It won’t be as good at cutting through larger trees as the chopping ax, but it is still a very handy tool to own. People take these hatchets with them on camping trips in order to chop wood. One of the most convenient uses for a hatchet like this is splitting wood. If you like to make logs to use in a fire, then owning a hatchet like this is a very sensible choice. It can be good to have a hatchet like this around when you want something small to handle a smaller job. For larger tasks, you will want to turn to the aforementioned chopping ax. Crosscut saws are great because they will be able to help you cut down trees without having to exert yourself too hard. You can place this saw on a tree and simply rock the saw back and forth. This rocking motion is more about finesse than it is raw power. Cutting down trees with this tool is very convenient and is one of the best manual tree cutting options that you can consider. The crosscut saw being shown off here is made to be very durable. You will be able to make use of it to cut down trees for many years. It weighs in at just under four pounds, but it is very rugged despite not being too heavy. You’ll be able to make use of this saw quite easily even if you aren’t a very large person. Professionals use these saws fairly often when they are cutting down trees. It can be a very handy manual tool to own, so you’ll want to consider making use of one. If you purchase one of these crosscut saws, then you’ll be able to quickly fell any trees on your property without much of a problem. They may be a little pricey, but the convenience makes purchasing these saws a good choice. Two-man crosscut saws are also available for you to consider. You have probably seen movies or cartoons where two lumberjacks are working in tandem to saw down a tree. The saw that they were using would have been a two-man crosscut saw. This saw is used by two people to cut down a tree in a very quick fashion. Two people rock the saw back and forth until the tree is completely cut down. You might be surprised by just how fast a tree can be felled when using a saw like this. Two people who know what they are doing with one of these saws will be able to use it quite effectively. It really isn’t that difficult to get used to the proper motion that you need to use for this saw either. Similarly to the standard crosscut saw listed above, this saw can cost a fair amount of money to purchase. If you want to get tree cutting tools that are inexpensive, then you may wish to go with a different manual saw. If you have someone to help you cut down the trees, then buying a two-man crosscut saw could be really helpful. You’ll be able to get your job done a lot more quickly than you would have alone, and it’s pretty fun to use. When you’re working with blades it is always good to take your safety seriously. You don’t want to have an accident and wind up hurting yourself. In order to keep yourself as safe as possible, it is highly recommended that you purchase a good pair of cut-resistant gloves. These gloves will keep you from accidentally cutting your hands while you’re working with various saws and power tools. The gloves are actually really easy to work in, as well. You won’t feel like they are limiting the dexterity in your hands because they have been designed specifically for ease of use. You can stay safe while still being able to work effectively. This is the convenient way to avoid careless accidents and keep your job going smoothly. The grip that you will have with these gloves is also excellent. You will never feel like your grip has been compromised due to wearing gloves. You can even still use touchscreen devices such as your phone while wearing these gloves. They’re a great option to consider if you need a good pair of protective gloves. Owning a chainsaw helmet is also highly recommended if you are going to be cutting down trees regularly. Cutting down trees and heavy branches will always come with certain risks. Being able to protect your head from potential falling tree limbs is important. A good helmet like this one is capable of withstanding an impact so that you can stay safe. The helmet also comes with protective earmuffs that can keep your eyes safe from the loud noises of your chainsaw. Keeping your hearing safe is really important, and you don’t want to have to deal with hearing a loud chainsaw all day. These helmets come with ear protection for that reason, and you’ll love not having an obnoxious ringing in your ears when the workday is done. They feel comfortable to wear and won’t cause you any problems. Helmets also come with protective visors. The visors are important because they help to keep debris out of your face. Chainsaws kick up a lot of sawdust and other debris when you are using them. You don’t want to get sawdust in your eyes and then have an accident, so purchasing this helmet is truly going to prove useful to you in the long run. Chainsaw chaps should be purchased for the same reason as the cut-resistant gloves. You want to ensure your overall safety while using dangerous tools such as a chainsaw. This may not be necessary if you are using manual tree cutting tools or just trimming your trees. If you are felling trees with a chainsaw, then having the right protection is going to be important. 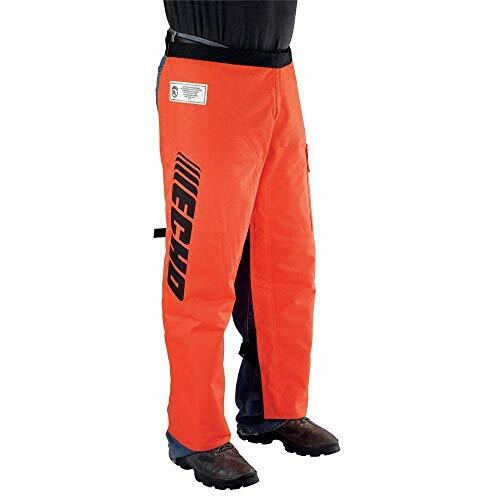 Chainsaw chaps are made out of protective materials that can prevent you from cutting yourself if your chainsaw slips. These chaps will protect your legs in order to keep you from harm in the event of an unfortunate accident. You don’t want a chainsaw to make contact with your thigh even briefly, as it could nick an artery. This could be potentially tragic, so you can see why chainsaw chaps are so important. Purchasing chainsaw chaps won’t cost you too much money overall. If you are going to be using a chainsaw on a regular basis, then it makes sense to purchase chaps that will keep you protected. They’re a worthwhile purchase, and you’ll feel more comfortable while wearing them. It’s important to take the necessary precautions, so make the purchase if the work you are doing calls for them.